HappyLyrics is a browser add-on which searches for the lyrics of the video that you open on YouTube and displays the text next to that video. If you do not remove HappyLyrics, beware of various unwanted contents that will be displayed by the program. 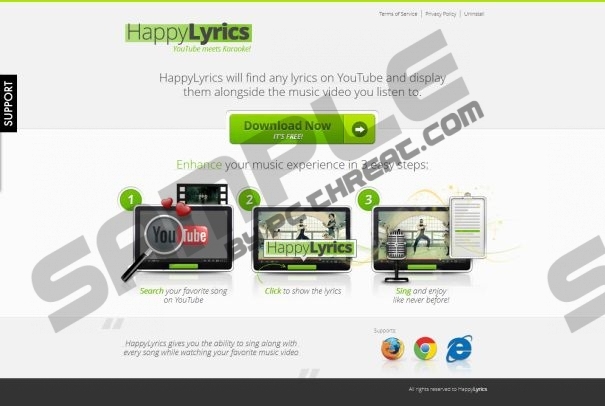 HappyLyrics is regarded as an adware program because it is supported by various advertising services and work in the same way as OLyrics and LyricsWoofer. It is compatible with Internet Explorer, Google Chrome, and Mozilla Firefox, and it can be bundled with various free applications, including browser extensions which are built on Conduit’s platform. If you pay attention to the license agreement of the program, you will notice that there is a section in which you are warned that the licensor may offer changes on your browsers. It means that the homepage, default search engine, and new tabs can be changes, which is why you should never hurry to install a program. HappyLyrics collects information about your browsing habits in order to provide you with targeted advertisements. It records your search queries, your browsing history, and other non-personally identifiable information. it is very likely that you will find advertisements that promote items that have nothing in common with you search terms. Various in-line ads and pop-ups may invite you to try computer games, download a computer application, or take part in a survey or a sweepstake. Neither of the offers should be approved in order not to access an insecure website. Remove the unwanted program if you want to stop annoying advertisements and prevent adware and other unwanted programs in the future. HappyLyrics is a program which does not monitor its partner’s actions and content available on their websites. Every time you access a particular website that is provided by HappyLyrics, you are exposed to the content which is not affiliated with the free browser add-on. If you want to make a purchase or buy some service, first make sure that the service provider is reliable, because once present on an unreliable website, you may be beguiled into downloading a counterfeit program or paying for non-existent goods. When it comes to removal, we recommend that you implement SpyHunter. This real-time anti-spyware program will easily eliminate the unwanted program and safeguard the system against computer threats. You will not have to worry about malware and spyware because the recommended tool can easily fight various computer infections off. Below you will find our step-by-step uninstall guide, which may help you to uninstall HappyLyrics, but keep in mind that even when you manage to uninstall it, the system must be scanned for malware. Select Control Panel and click Uninstall a program. Now when you have uninstalled the unwanted application, scan the system to find out what files or harmful programs should be removed from the system. To do so, click the button below and download a scanner, which will examine the system and provide you with the search results in no time. Quick & tested solution for HappyLyrics removal.